Green Bug combines 2 trails, plus a bit more. 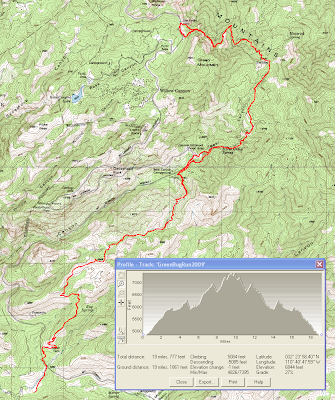 Trailhead: Drive past Milepost 7 on Mt. 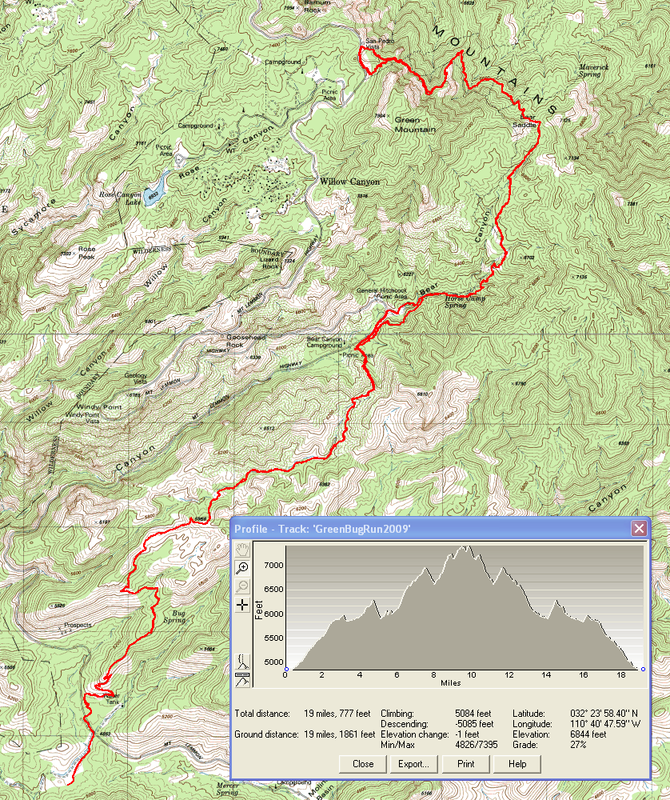 Lemmon Highway, then turn left into Gordon Hirabayashi Campground (Prison Camp). Drive all the way back to the circular parking area. Park and start from next to trail head at the far end of the parking lot. Route: Run up to road to the first bridge crossing the creek near the highway. Cross the bridge and you'll see the sign and the connector trail that parallels the highway a short distance, then crosses the highway and joins the Bug Spring trail. Continue up the Bug Spring about 4.6 miles to upper Bear Canyon, where Bug Spring ends. You cross a couple of ridges and enter forest along the way. There's a big sign at the end. Green Mountain Trail continues on and up. going around General Hitchcock Campground to join the original Green Mountain Trail, which used to end inside Gen. Hitchcock. Try to pay attention to where they join for the return. Green Mountain goes up the canyon a bit, then begins to climb steeply out. It climbs to a saddle with great views of the San Pedro Valley, then works it's way along the north flank of the mountain with some ups and downs. There are 3 junctions you'll pass for other trails. Stay on Green Mt. Near the end, there's an unmarked trail up and left you'll pass. Soon after, you drop out at San Pedro Vista parking area, which was the original top end of Green Mountain. You've gone about 4 miles from Bug. Trot a couple of hundred yards down the road to the new trail head. Pick up the trail over the ridge, then drop down to the unmarked junction. Turn right (east) and take Green Mountain Trail back down. It's not uncommon for people to get confused at Gen. Hitchcock and come out on Mt. Lemmon Highway, then trot down the road to the Green Mountain/Bug Spring trail parking area. Regardless, pick up Bug Spring. When you get near the bottom of Bug Spring, take the trail cut-off to Prison Camp again. Here are a couple of maps. 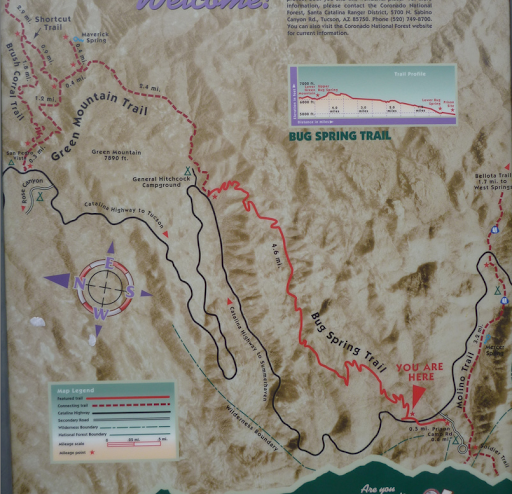 First a photo of the Forest Service map sign at Bug Springs Trail Head (which you should never see...), then a GPX trace of the route on a topographic map.